Workaway can be a great way to travel the world and is usually worth it for the budget traveler. However, the way that Workaway reviews work could be improved. 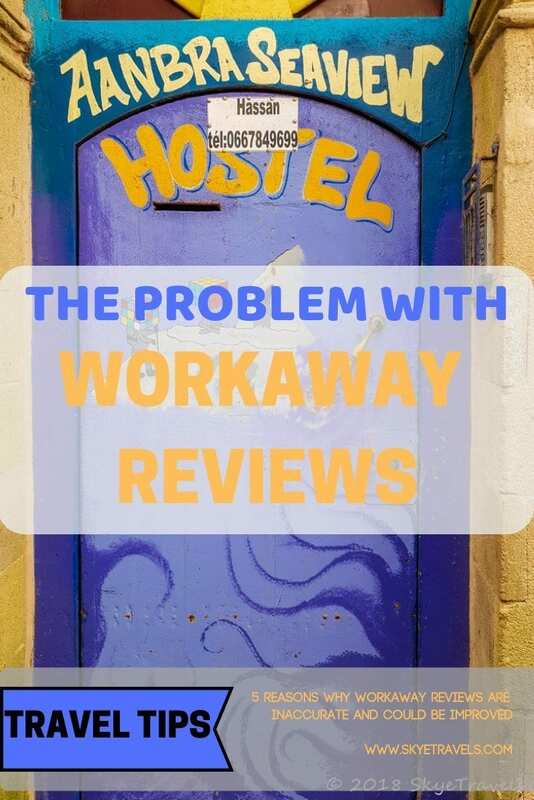 Unfortunately, Workaway does not require that the person leaving a review has actually volunteered for the host, or vice-versa. At my Swedish Workaway experience, I was told that I was their first volunteer with Workaway, yet they already had several reviews on their profile. I learned that the people leaving reviews had just been friends who happened to also be on Workaway. I’ll also admit that I once had someone leave feedback for me because they knew me personally and liked my work, but I hadn’t specifically worked for them via Workaway (I did sign up to work for them later). On Couchsurfing, if you have not been hosted by someone, you can only leave a “personal” reference instead of a reference as a host or a surfer. Granted, most Workaway reviews are from volunteers, but that’s not always the case. The reason the text does not appear is that when negative feedback is left, it is our policy to publish the negative feedback smiley and keep the comments for our records. We do this to avoid “revenge” feedbacks and then having to deal with a situation which is often subjective and personal to each individual case. Obviously the purpose of feedback is partially to acknowledge the host and tell about how much you liked (or perhaps disliked) the activity, but more importantly, it serves as a guide for future volunteers. If this information is removed, obviously it defeats the purpose of the feedback. Unfortunately, most websites don’t demand that you leave a review. As covered in the point above, Workaway reviews have a purpose to inform future volunteers of what to expect. Positive reviews serve the vital role of acknowledging your host for a great experience and encourages other volunteers to help them. Negative feedback usually helps to fill in points that were missing from the host’s profile. Often the host doesn’t mention there is no running water, that the volunteer must pay for their own food, that it will cost an extra €100 to get out to the plantation or mountaintop on local transportation or whatever (all of which I’ve seen in reviews or experienced personally), and the only way to find out these salient points are through the Workaway reviews. This isn’t to say all profiles are untrue or lacking; quite the contrary! Most hosts will say that they have no internet, only eat vegan, live off the grid with no utilities or have wild working hours, and the volunteers who accept these limitations are usually happy to do so. There is also a disadvantage when the host or volunteer leaves a review and the other does not reply. While Couchsurfing will follow up to get the feedback posted, Workaway doesn’t even know that you’ve volunteered, and thus doesn’t know to so follow up. Even when you do leave feedback, it doesn’t require for the other to respond, beyond informing them that they have new feedback. This can also create a misleading picture if all the feedback on a host’s profile is left by the host (all of which is positive) and none of the volunteers comment to verify the accuracy of the feedback. Once again, Couchsurfing has the right idea on this. Earlier, you were able to modify any reference left for a host or surfer after posting. With the 2016 update to their website, you have a certain time frame in which to do so, after seeing the feedback left for you. This is not the case for Workaway. As soon as you submit your Workaway review, it’s set in stone and there permanently. This could obviously raise problems if you left your feedback first, and then the host or volunteer said something you want to clarify. There’s no way to do this, other than writing the clarification in your own profile (where it doesn’t really belong). This could also discourage people from being the first to leave reviews. This is a strange one. Basically, all feedback left by the host shows up on both the host’s and volunteer’s profile page. But if the volunteer leaves feedback for the host, it shows up on the host’s profile but will only show up on their own profile if the host responds. It’s not necessary for it to do so, but there are many reasons why it would be good. Also, because all reviews from hosts show up on their own profile, they can leave plenty of great feedback for other volunteers and make themselves look really good, even if the volunteers don’t agree. I’ve seen this where the hosts leave great reviews while the volunteers say the experience was less than optimum. Overall, Workaway is a great way to travel around the world while getting new experiences and skills and learning about the local culture, not to mention being able to travel indefinitely on a very low budget. I’ve personally completed or a dozen Workaway experiences all around the world, not to mention many more volunteer jobs I found outside the website. Despite the disadvantages of Workaway reviews, it’s still a great site. I think I’ll try HelpX.net next since they require hosts to respond to requests, something lacking on the Workaway site. Although I’ve seen an exponential increase in the number of hosts on Workaway in recent years, the website can still be improved. Hopefully someday we’ll see a comparable platform to Couchsurfing. Next Did you have a Terrifying Moment in 2015? I did! Great article! I’m currently struggling at a workaway on a really productive farm where the work is interesting and the accommodations and food are great but the social/family aspect is kind of lacking. The mother is away and the father seems constantly stressed to the point of breaking, so I’m spending most of my spare time trying to stay out of the way. I’ve tried helping out around the house multiple times, but I seem to be doing everything wrong. Eg, I was putting away milk that had been sitting out only for the father to say he was still using it (he then left and it was sitting on the bench for another two hours). Basically I feel like I’m having trouble gelling with the family life and routine here, and the father is so busy I haven’t had a chance to bring it up with him. I said I’d stay for a month but it’s been 2 weeks and I really want to leave just because of how awkward I feel. The only problem is I’m worried about feedback. They have only glowing reviews so far, which makes me think my experience is either an anomoly or it’s entirely my fault. I’d like to improve the experience and stick it out, but I’m really at a loss for what to do. Dear Anna, Thank for your comment. I totally understand what you’re running into. One of the advantages of Workaway is that you have the option of leaving whenever you need or want to. Obviously the feedback can be a concern, but I think if you make your reasons clear, they should have some level of understanding. There’s also the chance that if you don’t leave feedback for them, they won’t leave any for you. Neither of you are required to leave feedback, which unfortunately does contribute to part of the problem of the site – missing negative reviews. As I mentioned in my post, I was once forbidden by one host from leaving any negative feedback. Should have been my first warning. You could always try to wait it out, as I did in Sweden (Skyetravels.com/Sjuntorp), or you could let them know why you need to end your stay. There will always be personality clashes now and then. You just have to decide whether you want to handle the connection with them through some clever communication skills, or decide it’s time to move on. Good luck with whichever choice you make. I’m also planing on using workaway, and in my research i found your blog. Very helpful by the way, i also read the other one you posted about workaway. I have a question, Did you write to workaway telling your feedback? did anything changed already? Hi, thanks for your feedback! I did write to Workaway, but didn’t get the most favorable answer. Granted, that was awhile ago, so perhaps they’ve updated their operations. I actually haven’t used Workaway for the past year, since I’ve been able to get jobs around the world off the website. There are a bunch of hostels you can just walk into and find work, restaurants and bars to help in, farms, etc. For every host that uses Workaway, there are a hundred more who don’t know about the site but who need volunteers. You only have to ask.